The Cisco 3800 series router is designed to provide integrated services to your SMB or enterprise branch offices in a cost-effective manner. The equipment design allows you to simplify the deployment and management process while lowering your overall costs and reducing the complexity of your network. Support mission-critical applications that your business relies on every day by building out a smart network using the Cisco 3800 series. 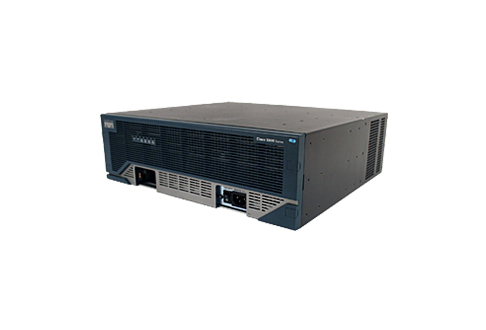 Even refurbished Cisco 3800 models can provide you with concurrent T3/E3 wire-speed for your data, security, voice, video and wireless networks. Even used Cisco 3800 models are able to provide as much as 10 times the performance of the previous generation Integrated Service Router, according to Cisco. Use the menus below to find the right model for your needs and save big with a reliable, tested and quality-approved refurbished Cisco 3800 ISR from Worldwide Supply. Cisco’s integrated service routers are a must-have for branches and SMBs because they keep everything strong, running and secure in an affordable manner. You want the best equipment options at the lowest prices, so you’re considering support from outside the OEM. Worldwide Supply invites you to think about maintenance in the same way. Consider choosing third-party Cisco 3845 support for your integrated services routers to keep your savings alive, while also delivering the data, security, voice, video and more in the right locations. We provide a comprehensive solution for your Cisco equipment that focuses on maintaining your equipment for years of additional life. If the network goes down, our third-party Cisco 3845 support also provides you with a clear replacement option and on-site inventory backups while still helping you reduce inventory costs. You can choose an individual OEM package, like our third-party Cisco 3845 support, or opt for the NetGuard Maintenance program that covers more than 100 different OEM product lines under a single contract. We’ve positioned our service centers to make it possible to reach every major market on the planet within 24 hours, plus four-hour onsite service for most locations. Trust proven engineers who have spent decades bringing used and refurbished equipment back up to original OEM standards with the longevity of your network. We’ll turn any third-party Cisco 3845 support package into a value-added benefit for your network.